When Early Pearl's father Dash goes missing and leaves behind a trail of danger and chaos in his wake, Early, along with her mother and little brother Jubilation, must flee from their home and are forced into the Chicago shelter system. With very little to go on and having to be the source of strength for their family since her mother quickly falls into the depths of despair, Early is determined to find out what happened to her father. She is certain he didn't abandon the family as the police seem to initially think. Armed with a first edition of Langston Hughes's First Book of Rhythms, Early finds strength in Langston's words and a connection with her absent father as she repeats Dash's oft proclaimed mantra, "What's the rhythm Langston?" But if Dash didn't walk away from the family, what did happen to him? And the question that worries Early the most: when they find him, will he be dead or alive? Early knows the answer will come from searching through the rhythms and patterns of Dash's work life at the Chicago Public Library, but will she stumble upon information that some people don't want her to find out? I have listened to two of Balliett's previous works on audio, Chasing Vermeer and The Wright 3, and while I found both of those books to be fairly enjoyable and competent mysteries, they were missing some sort of emotional spark. I appreciated that both books appeal to the intellectual, analytical reader, but I just wasn't feeling anything for the characters. That is absolutely not the case in Hold Fast. Dash, Summer, Early, and Jubilation make the story. Yes, the mystery is important, but that added emotional element of joining Early on her plight to find her father and to get their home back is so harrowing and heart-wrenching that you just want to take Early and Jubilation in your arms and bring them home with you. What really made me connect with the story even further, however, was Balliett's use of Langston Hughes's works as inspiration to keep Early going. Langston Hughes is one of my all-time favorite poets and whenever I teach poetry to my middle school students, Hughes is always part of the discussion. I absolutely see myself using Hold Fast as a read aloud around the time of a unit on the poetry and life of Langston Hughes. Something else I really appreciated about this story is Balliett's exploration of child homelessness through a mystery novel rather than making this a straight-up issue book, which might be a bit difficult for middle grade children to tackle outright. I think she made the issue of homelessness a bit more digestible for her readers -- sprinkled throughout the mystery -- and yet at the same time, she doesn't pull any punches with regards to it being a societal ill that we can't just ignore. Another aspect that made me thoroughly enjoy this book was the audio production. 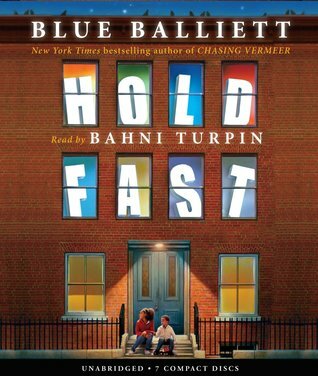 Once again, Bahni Turpin proves why she's my favorite audiobook narrator. All of her performances that I've listened to have been nothing short of brilliant and Hold Fast was no different. Her voices are distinct and her emotional timbre is spot on. Cover Comments: OK, so I'm happy to see that Scholastic wasn't afraid to actually put children of color on the cover since so many publishers seem to be afraid to do this, but I wish the children weren't so small. They're almost unrecognizeable as African American because they're so far away. I think the kids could be much more prominent and the building much less so. This is one of my very faves from this year. I'll bet the audio was really good. The Hughes connections were beautifully woven in. Great review Beth!